The Work Portal offers a way to revoke and copy user permissions using a simple interface. 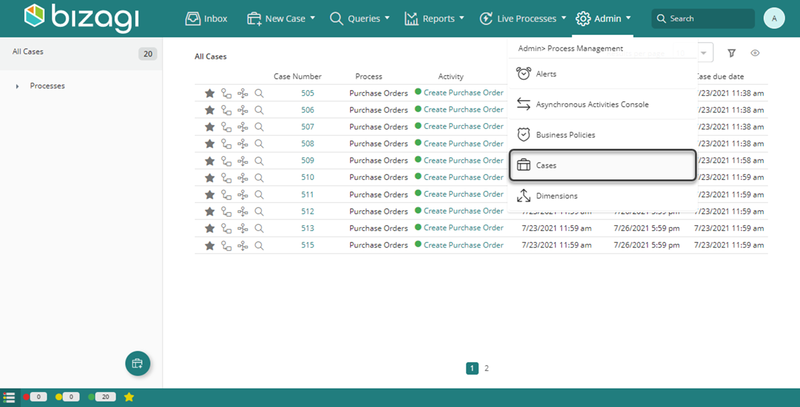 To access this feature select Cases on the Admin menu. A pop-up window appears, go the Case Security tab. From this view you can either copy user permissions or revoke user permissions. Next, search for the user you wish to copy the permissions from as the Current user. Once you click the search icon ( ) a user search appears. You can filter your users by domain, full name, user name and organization name. Fill out the filters and click Search. The list of users that match your search criteria appears. Now you can select the user you wish to copy permissions from by clicking Select. To remove the selected user, click the X icon located next to their name. You can select the user you want to copy the permissions to as the Target user in the same way. Once both users are selected, you can either copy the permissions from all the applications or from a specific process. To choose a process, select the Select Process option. Navigate to the process you wish to copy the permissions from. After the process is selected, click Copy permissions to finish. A confirmation message appears, click Yes. Finally, a notification appears informing how many cases the target user can now access. Next, search for the user you wish to revoke the permissions from as the Current user. Fill out the filters and click Search. The list of users that match your search criteria appears. Now you can select the user you wish to remove permissions from by clicking Select. 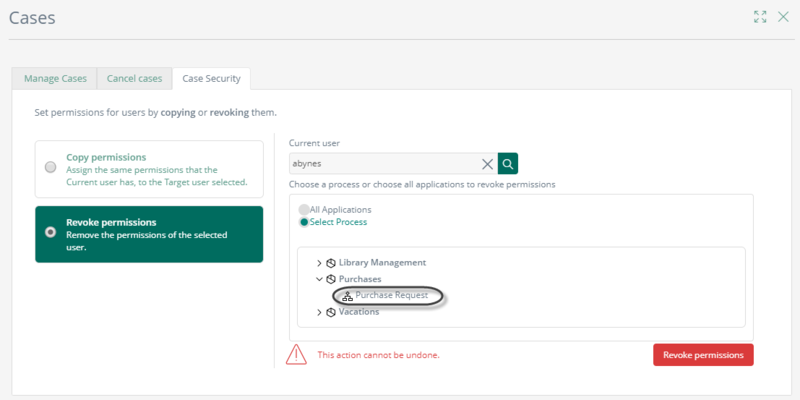 Once the user is selected, you can either revoke the permissions from all the applications or from any process that has Case Security enabled. Navigate to the process you wish to revoke the permissions from. After the process is selected, click Revoke permissions to finish. Finally, a notification appears informing in how many cases the access was revoked for the user.